Lighthouses did not appear on the North Carolina coastal horizon until the last years of the eighteenth century, even though North Carolina, of all the coastal colonies, clearly was in need of navigational aids. The barrier islands that parallel the mainland are particularly prone to shoal waters, shifting sand bars, and disappearing inlets. Dangerous underwater shoals are especially prominent off Cape Hatteras, Cape Lookout, and Cape Fear. The state's first lighthouse was built at Bald Head on Smith's Island just off Southport (Smithville). The U.S. Congress took on responsibility for lighthouse construction and maintenance in 1784, but it was 1792 before funds were appropriated for the Bald Head Light. Three additional appropriations were required to cover cost overruns before the tower was finally lighted in 1795. Its beacon guided mariners around the treacherous Frying Pan Shoals that obstructed clear sailing into the mouth of the Cape Fear River. Wilmington, 20 miles upriver, was the state's only deepwater port facility. The light lasted a mere 25 years, replaced in 1818 by a 109-foot facility farther from the water and the effects of erosion. This light still stands as the state's oldest. North Carolina's second lighthouse in the state was constructed at Shell Castle Island, a lightering and warehousing complex built on an oyster rock inside Ocracoke Inlet by John Gray Blount and John Wallace. The light was a pyramid-shaped wood-frame structure with a shingled exterior that stood 55 feet tall. It guided mariners through Ocracoke Inlet and into Wallace's Channel. The light was struck by lightning and destroyed in 1818, a final humiliation for the complex, which by that time had already been deserted due to the shoaling of the channel. The congressional act of 1794 that authorized the Shell Castle Island light also provided for construction of a light at Cape Hatteras, the easternmost point in North Carolina and the home of some notoriously treacherous waters. Diamond Shoals stretches 14 miles into the Atlantic from Cape Hatteras, a meandering clutch of sandbars and shoals that have grounded hundreds of ships. Moreover, the northward flow of the warm Gulf Stream collides with the southward thrust of a cold Labrador Current off Diamond Shoals, creating a maritime corridor so turbulent it has been nicknamed the Graveyard of the Atlantic. Despite an obvious need, Cape Hatteras was not lighted until 1803, when what has been described as a sandstone structure some 100 feet in height was built. This light proved inadequate, and in 1852 Congress appropriated funds to elevate the tower and install a new and modern Fresnel lens. The work was completed in 1854. The existing Cape Hatteras Lighthouse was constructed between 1868 and 1870 at a cost of $155,000. The massive structure, requiring 1.25 million bricks and featuring solid masonry walls 14 feet thick at the base, for more than 100 years has served as a vital warning sign to sailors venturing into the waters of Diamond Shoals. At 198 feet in height, it remains the nation's tallest masonry lighthouse and perhaps the most famous and photographed lighthouse in the world, with its unique black-and-white spiral design recognizable to millions. In 1999 the Cape Hatteras Lighthouse was moved 2,900 feet to avoid destruction by the encroaching Atlantic, the shoreline at the time of the move being only 120 feet from the light. Cape Lookout, at the southern end of the Outer Banks, did not have a light until about 1812. The light constructed then had two towers, a brick tower 93 feet high inside a wooded, shingled tower painted in red and white horizontal stripes. It was replaced in 1859 with a new tower of 150 feet. During the Civil War, Confederate troops tried to render it inoperable-as they did for other lights along the Federally occupied coast-but did not manage to destroy the structure. It stands today, its black-and-white diamond design a signal to mariners that they are nearing Shackleford Banks and Beaufort Inlet. The lost nineteenth-century town of Diamond City on Shackleford Banks took its name from the Lookout light. ew light for Ocracoke Inlet, and in 1823 the present-day light went into operation. Though slightly newer than the state's oldest light on Bald Head, it is the oldest light on the Outer Banks. In the late 1830s and 1840s, in a concerted effort to render the Cape Fear River safe for navigation up to Wilmington, a series of small lighthouses was erected from Oak Island at Caswell Beach to the very outskirts of the port city. Lights were also situated at Price's Creek, Horse Shoe, Orton's Point, Campbell's Island, and Upper Jettee. The 1850s were boom years for lighthouse proponents. A congressional review that year led to efforts to upgrade and standardize lighthouse operations. A Light House Board was established to oversee management and improvements. 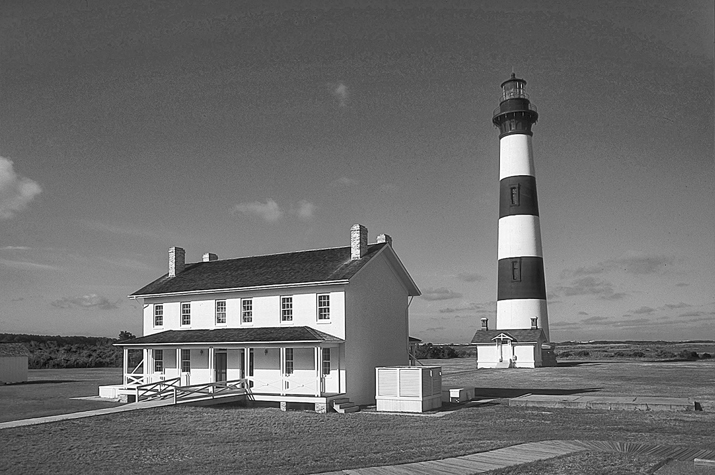 Bodie Island and Beacon Island were already scheduled to receive lights and did so in 1852. Ocracoke Channel also got a light that year. Old Topsail (Beaufort) Inlet received two lights in 1855, both of which were destroyed a few years later by Confederate troops from Fort Macon. In 1859 a second Bodie Island Light went up, a 90-foot brick structure painted white and topped with a Fresnel lens, but Confederate troops destroyed the tower during the war. A final light of 150 feet was erected in 1872 and remains standing. 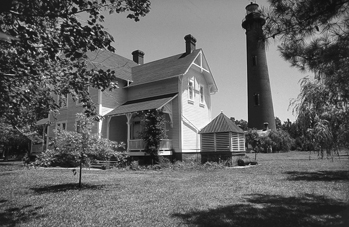 The first Currituck Lighthouse was lighted in 1875. It was left in its natural red brick to distinguish it from the other lights. The newest and brightest light in North Carolina was erected at Oak Island in 1958. The expense of lighthouse construction inspired Congress to look at alternatives for navigational aids. One answer was lightships. These bulky tankers had no function other than to anchor near shoal waters and shine their lamps brightly for passing maritime traffic. Another alternative to land-based lighthouses were "screw-pile" lighthouses mounted on pilings over the water. Frame houses built onto pilings with lights on their roofs, these screw-pile lights withstood wind and high water better than lightships, which they replaced after the Civil War. At least six screw-pile lighthouses hovered over North Carolina's sound waters in the second half of the nineteenth century. By the beginning of the twenty-first century, there were seven lighthouses still standing in North Carolina: Currituck, Bodie Island, Hatteras, Ocracoke, Cape Lookout, Oak Island, and Bald Head Island. All except Bald Head, which is privately owned, are electronically operated and under the jurisdiction of the U.S. Coast Guard. Cheryl Shelton-Roberts and Bruce Roberts, North Carolina Lighthouses: A Tribute of History and Hope (2004). David Stick, North Carolina Lighthouses (1980). Maritime history and survey of the Cape Fear and Northeast Cape Fear rivers, Wilmington Harbor, North Carolina. Volume 1: Maritime history, NCDCR Digital Collections. NC Lighthouses, uploaded February, 2011. Courtesy of Our State Magazine and UNC-TV (with support from BB&T). Available from http://www.youtube.com/watch?v=H8X7ijMOvK8 (accessed September 7, 2012). 1 January 2006 | Barfield, Rodney D.
Pursuant to a call the citizens of Carteret county assembled in large numbers on Cedar Island, August 12th, 1880, to take some action in regard to the abandoning of Harbor Island Light House. The meeting was called to order by Capt. Joseph Lupton who nominated Geo. W. Day, Esq. for Chairman and W. H. Phillips as Secretary. The Chairman explained the object of the meeting in a few remarks, he was followed by Capt. John J. Lupton in a few well timed and pertinent remarks as to the dangers attending all navigators of the inland waters of North Carolina with no light on this dangerous Bar, and moved that the Chairman appoint a Committee of five to draft resolutions expressing the sentiments of the people in regard to the action of the officials in discontinuing this important light. Thank you for visiting NCpedia! I have forwarded your questions to reference services at the NC Government & Heritage Library. A reference librarian will contact you shortly to help. Hello! If you are looking for a bit of information on the Bodie Island lighthouse, there is information and a link to its website in the 8th paragraph down. Here is a link to its website, however, too: http://www.nps.gov/caha/historyculture/bodie-island-light-station.htm. Well the Ocracoke lighthouse is the second oldest.The Ocracoke lighthouse was built in 1823.